Oh, my gosh, look at these. They’re umbrellas! My daily email from Skirt showed these cuties from Fredflare.com. As a child, I loved my dolls. 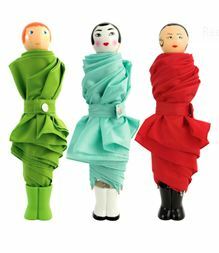 I’m not a big fan of dolls marketed for adults, but these made my heart beat a litle faster when I saw them. What a way to bring a smile on a rainy day!